FENCING COACH IS FINALIST IN DUNKIN DONUTS DESIGN CONTEST! To win, Wiley needs the support of bake-off judges and of the general public, who can vote for their favorite donut online through May 3. As of Wednesday, Wiley was in a second place with 12 percent of the votes. To vote for Wiley, click here. He’s now one of the 12 finalists! Go Fencers! Four Score and 20+ hours of Flying Later…Ben and I arrive in Bangkok…Our bags remain at JFK! Bangkok, Thailand — 14+ hours to Beijing, a quick layover and then a 5+ hour flight to Bangkok only to discover that somehow our fencing bags never made it out of JFK! Definitely not what you want to hear after a super long trip! Not sure how that happened and it’s a first for me. After 300+ or more flights out of JFK in my life I’ve never had my bags not get out of NYC! Ben and I both arrived at JFK with plenty of time for them to make it on the flight (I was there 3 hours before flight) so my only suspicion is that perhaps someone doing the bag check didn’t know about fencing and held them because of either the sabers or body cords…who knows. If not, just gross negligence of the Air China folks…Which after our flight experience wouldn’t be that surprising! Luckily, we carried most of our stuff on the airport so we’ll just need to borrow sabers…and I guess buy some underwear! They said our bags might arrive by Saturday. (The first day of the competition) Anyway, we’re spending the night in Bangkok and then meeting Coach Dmitry Guy in the morning to head to the competition hotel in Pattaya…about a 3 hour bus ride. 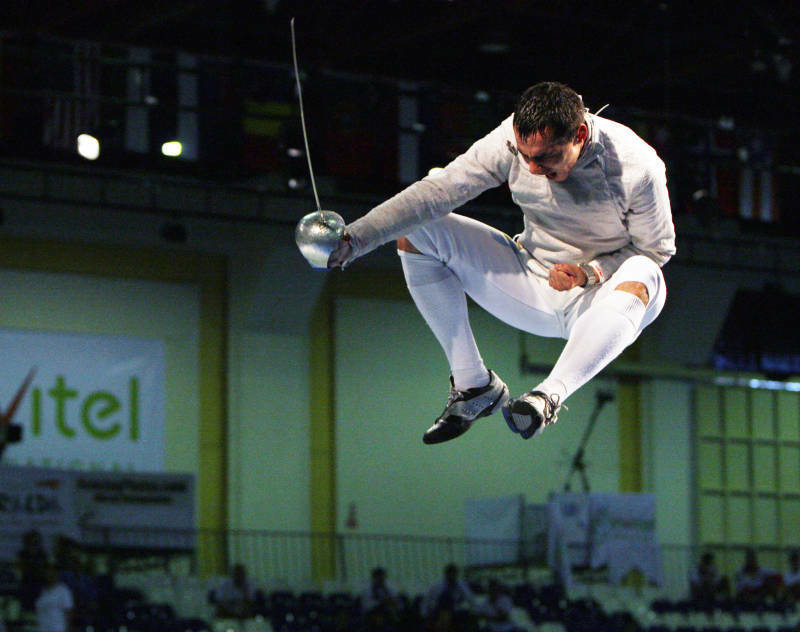 Cool Fencing Picture of The Day: Don’t Think fencers are athletic? Think again. 14 hour flight to Beijing, 3 hour layover, 6 hour flight to Bangkok, overnight stay at airport hotel, 3 hour bus ride to Pattaya….all for about 10-15 minutes of actual business. Some kind of crazy travel torture? Well, yes, but it’s also the resuming of the international fencing schedule as tournaments kick off in Asia this weekend! So, you want to be an Olympic fencer, ehhh? USA Fencing National team members are departing for competitions in China and Thailand today. Men’s and women’s foil will be competing in Shanghai, China in a world cup for the women and a Grand Prix event for the men. 2/3 of the men’s saber team, Ben Igoe and Tim Morehouse, along with Mike Etropolski and a number of other USA fencers are heading to Pattaya, Thailand for a world cup. Daryl Homer will remain in NYC to rest after a busy 3 months competing in Junior world cups, college tournaments and senior world cups.You can follow the men’s saber team right here and on my twitter: www.twitter.com/timmorehouse and I’ll try my best to update men and women’s foil via Ambika Singh’s bbms to me!Women’s foil heads from China to Korea following their competition and the men’s saber fencers will head home to prepare for the Spain and Italy World cups 2.5 weeks later. Go Team USA!